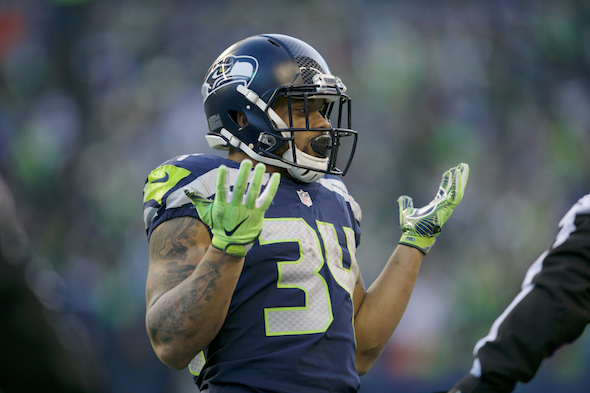 One time a great notion: Thomas Rawls looked in 2015 like the successor to Marshawn Lynch. But injuries thwarted him, and now he’s a New York Jet. For a few weeks in 2015, Thomas Rawls looked like a guy who could do a fair impression of RB Marshawn Lynch: Aggressive, fearless, blessed with speed and power. Turned out to be a pipe dream. Limited by injuries, Rawls never recovered his early form and was released into free agency earlier this month. It’s the New York Jets’ turn to try to rediscover what Rawls flashed. The Jets announced Friday they had signed him to a one year deal, with no terms publicly available. Filling in for the injured Lynch, the undrafted free agent out of Central Michigan rushed for 209 yards against the 49ers to set a club rookie record. His 5.6 yards per carry average led the the NFL. After breaking an ankle in December 2015, his yardage total went from 830 to 349 in 2016 and to 157 the past season, including four games in which he was not on the active roster despite injuries to other Seahawks backs. The Seahawks signed Mike Davis, who became the featured back late in the season, to a one-year deal worth up to $1.35 million, likely ending Rawls’ chance to return to Seattle. One of Lynch’s lesser appreciated skills was the patience to wait for his blockers to do their jobs. Rawls was always on blast when he could have spent a moment on glide to allow a hole to develop. He knew only one way to play. The Seahawks expect to have a return to full health for Chris Carson, the seventh-round rookie pick a year ago who showed promise until he, too, broke an ankle after four games. Besides Davis, the Seahawks also have two other running backs under contract: C.J. Prosise and J.D. McKissic. It’s all but certain the Hawks will draft a RB. Maybe more than one. Agreed, only real question is whether it will be a day 1 / 2 pick or 3 day pick like they have done in the past. I hope Rawls does well with the Jets, I always felt that if he didn’t get that serious ankle injury his career would have been different. I’m not sure why anyone bought the Rawls hype. I thought he was going to be waved before last season. He had a few great games mimicing Lynch, back when the O-Line wasn’t yet garbage. Everyone wants to point to that playoff game against the Lions, but… its the Lions. What great playoff prowess have they demonstrated? That was a fluke game against a bad defense.